Available as a self-charging hybrid, the new Camry expands Toyota’s line-up of hybrid electric vehicles to eight models. Toyota say its 2.5-litre hybrid electric powertrain combines fuel efficiency, low emissions and quiet operation with more power and greater responsiveness. 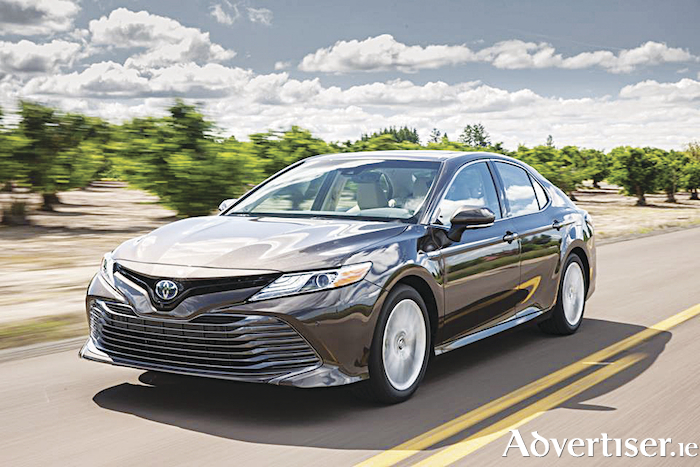 The new Camry is the eighth generation of a car that has won countless awards and distinctions since it first went on sale in 1982. The model is sold in more than 100 countries globally, with sales totalling more than nine million units to date. With annual sales of more than 700,000 units globally, Toyota says Camry remains the best-selling D/E-segment saloon in the world. The latest generation Camry showcases Toyota's new global architecture (TNGA ) design and engineering philosophy. Toyota says TNGA places 'fun to drive' characteristics and styling on an equal footing with build quality, highly efficient packaging, and innovative, user-friendly technology. To follow the Camry’s return to Ireland, potential customers can now register their interest on Toyota.ie, where they will receive regular updates between now and the launch in 2019, or contact local toyota dealer, Tony Burke Motors, Ballybrit, Galway, 091 480123.